What Types of Flowers Do Butterflies Eat? Some flowers get all the luck. Not only do they look and often smell nice, but many of them also attract butterflies, the most beautiful of all winged insects. Since butterflies usually migrate long distances, they require frequent feeding stopovers. Flowers, particularly their nectar, are vital to these fragile animals. Conservation groups encourage people to plant butterfly gardens because some species are in decline. Luckily, there are many flowering plants that butterflies like. It should come as no surprise that a cultivar named after butterflies attracts the insects. According to TheButterflySite.com, this plant is a favorite food source of butterflies. The honey-scented blossoms, tightly clustered on stem ends, come in shades of purple, magenta, white and pink. 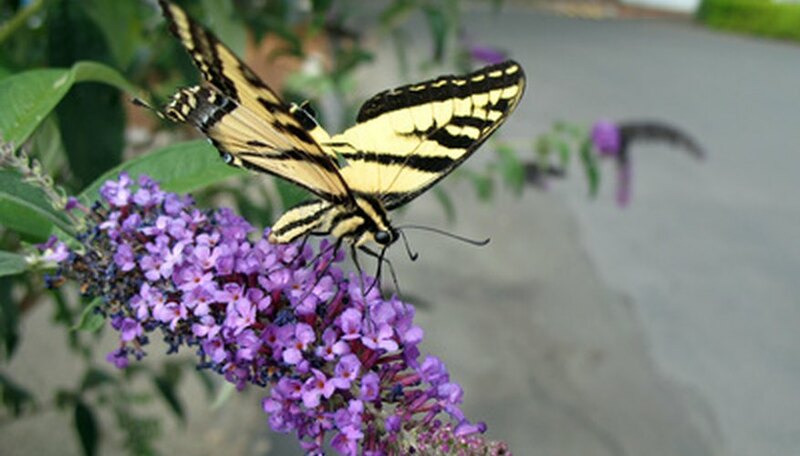 Butterfly Gardeners’ Quarterly states that more than 100 cultivars are grown. As it’s name suggests, Butterfly weed is also excellent at drawing butterflies to it because of its nectar abundance. Also called orange milkweed, this plant is native to North America and is drought tolerant. It grows well in full sun and in places like rock gardens, according to Texas A&M University Horticulture Department. Purple Coneflower is a hardy prairie flower, considered an herb, that blooms prolifically even during hot, dry spells. The petals come in yellow, white and pink shades as well. It is easy to grow and, with its height of up to 2 ½ feet, mixes well with shorter and taller butterfly-attracting plants. Hibiscus, Hawaii’s state flower, is a tropical and semi-tropical perennial with big, showy flowers that are also favorites of hummingbirds. The American Hibiscus Society explains that buds come in many colors, from stark white to reds bordering on black. People aren’t alone in their fondness for lavender. Butterflies like it’s fragrant scent too, particularly the sweet nectar that can be drawn from the small, light purple flowers. According to the University of Maryland Medical Center, lavender’s scent is emitted from the oil contained in the flowers. Lilac bushes bloom briefly in the spring, eliciting one of the better fragrances nature has to offer. Butterflies like them, too. Lilacs bloom in shades of white, purple, blue, magenta and violet, according to the International Lilac Society. This plant prefers moist, rich soil and full sun. The Texas A&M University Horticulture Department states it is a hardy perennial native to northeastern U.S. Flowers are rosy lilac to deep purple and are perched on stiff, hairy stems 2 to 6 feet tall. They are also later bloomers than some other flowers that butterflies like, appearing from August through October. What Flowers Are Poisonous to Humans? What Are the Benefits of Planting Flowers? Which Flowers Do Not Attract Bees? What Flowers Do Butterflies Pollinate?